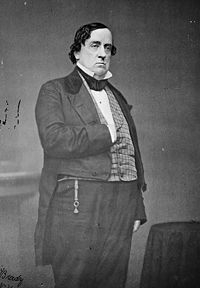 Lewis Cass (October 9, 1782 – June 17, 1866) was an American military officer and politician. He was the nominee of the Democratic Party for President of the United States in 1848. His political position endorsed a Jeffersonian political philosophy. He believed in agrarianism, individual liberty, and limited government. Cass was in full favor of United States expansion and supported President Polk throughout the Mexican-American War. Cass believed the United States could help people start new and productive lives. This belief coincided with the Manifest Destiny. The people of American at that time truly believed that God wanted the Americans to expand—that it was the United States' God-given destiny. Cass was born on October 9, 1782, in Exeter, New Hampshire the eldest child of a American Revolutionary War veteran, Major Jonathan Cass, and Mary Gilman Cass. He attended the Phillips Exeter Academy where he met and befriended Daniel Webster. In 1799 he moved to Delaware then Ohio to teach school. Cass found success in Ohio in 1799, he entered law school and was admitted to the bar at the age of twenty. He then started a law practice in Marietta, he became a member of the Ohio Legislature in 1806 and served as the United States marshal in Ohio from 1807 to 1812. Also, in 1806 he married Elizabeth Spencer. During the War of 1812, he served under Generals William Hull and William Henry Harrison and rose from the rank of colonel of volunteers to be major-general of Ohio militia and finally to be a brigadier-general in the regular United States Army. As a reward for his service in the war, he was appointed Governor of the Michigan Territory by President James Madison on October 29, 1813, and served until 1831. In 1820, he led an expedition to the northern part of the territory, in the northern Great Lakes region in present-day northern Minnesota, in order to map the region and discover the source of the Mississippi River. The source of the river had been unknown until then, resulting in an undefined border between the United States and Britain. The expedition erroneously identified Cass Lake as the source of the river. The source of the river was correctly identified in 1832 by Henry Schoolcraft, who had been Cass's expedition geologist, as nearby Lake Itasca. 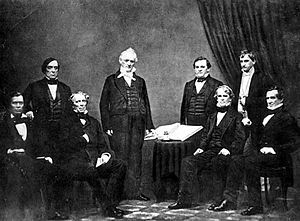 On August 1, 1831, he resigned as governor of the Michigan Territory to take the post of Secretary of War under President Andrew Jackson, serving until 1836. Cass was a central figure in formulating and implementing the Indian Removal policy of the Jackson administration. He was responsible for the direction of the Black Hawk and Seminole wars. He agreed with Jackson regarding his nullification controversy with South Carolina and the eviction of the Native Americans in Georgia. Cass represented Michigan in the United States Senate from 1845 to 1848. He served as chairman of the Committee on Military Affairs in the 30th Congress. In 1848, he resigned from the Senate to run for President. William Orlando Butler was his running mate. Cass was a leading supporter of the Doctrine of Popular Sovereignty, which held that the people who lived in a territory should decide whether or not to permit slavery there. His nomination caused a split in the Democratic party, leading many antislavery Democrats to join the Free Soil Party. He also supported the annexation of Texas. After losing the election to Zachary Taylor, he returned to the Senate, serving from 1849 to 1857. He was the first non-incumbent Democratic presidential candidate to lose election. 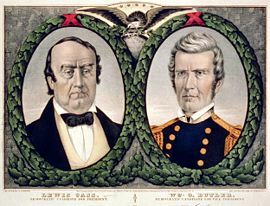 From 1857 to 1860, Cass served as Secretary of State under President James Buchanan. He resigned on December 13, 1860, reportedly disgruntled by Buchanan's failure to pursue a stronger policy that might have averted the threatened secession of southern states. Cass resigned from Secretary of State in 1860 and retired to Detroit. He died there on June 17, 1866, and is buried in Elmwood Cemetery in Detroit, Michigan. In 1948 the Detroit Historical Society of Michigan reinstated their lecture series and named it in honor of Lewis Cass who was Governor of the Michigan Territory and one of the founders of the Detroit Historical Society Guild. The purpose of these lectures was to present a discussion on an aspect of Michigan’s history. The lecture was presented by Francis Paul Prucha and was titled Lewis Cass and American Indian Policy. Prucha focused his discussion on how Cass successfully prevented the complete collapse of American Indian relations with the United States and described him as an "enlightened man of his times, and there was in him a strong, sincere, and persistent streak of humanitarianism." ↑ Francis Paul Prucha, Lewis Cass and American Indian Policy (Wayne State University Press., 1967. OCLC 1493415) 8. This page was last modified on 4 July 2018, at 20:17.